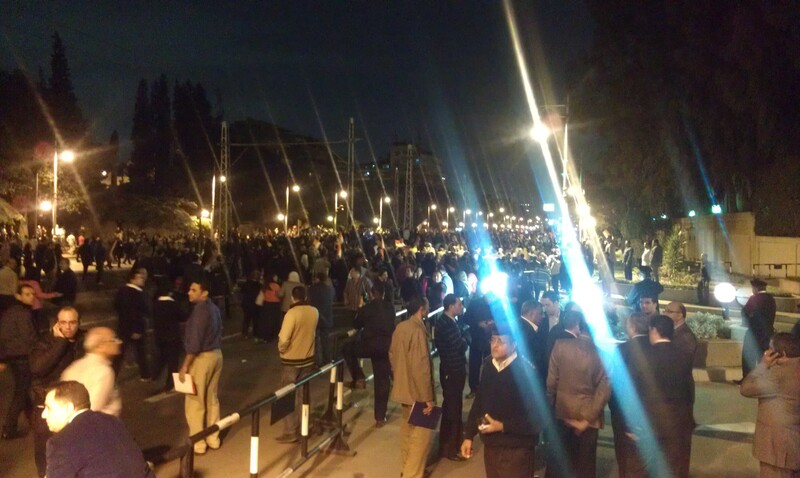 Tonight I stood by hundreds of thousands of Egyptians outside Morsi’s Presidential Palace. 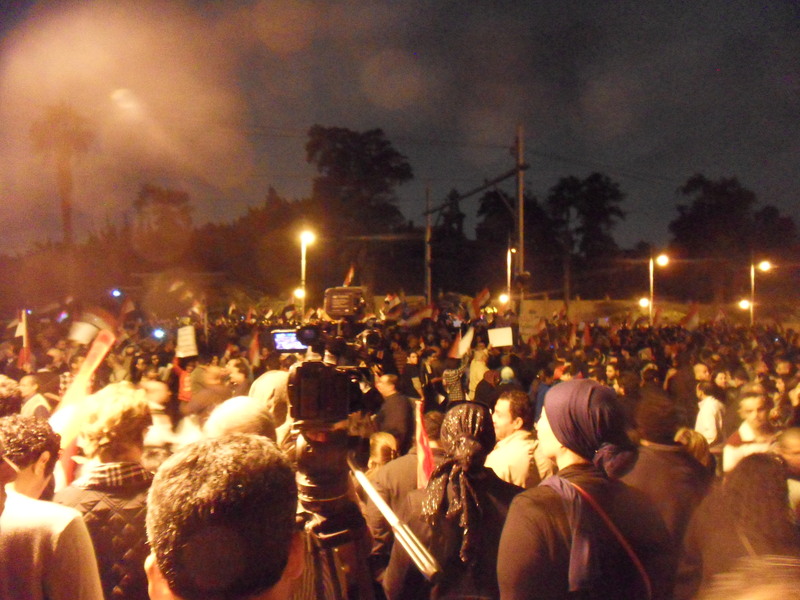 The protesters consisted of children, students, both veiled and non-veiled women, seniors – not one thug as Pharaoh Morsi claims. They were the most peaceful, respectable and honorable people I have ever had the opportunity to meet and stand by. 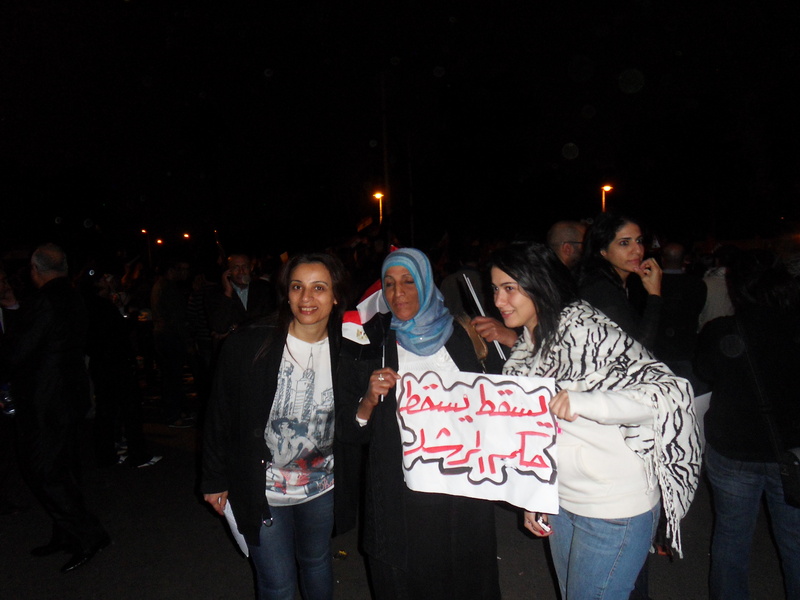 I arrived at the ‘Etihadiya’ when only several thousand protesters were present.Unlike my visit to Tahrir Square, there were absolutely no merchants: simply passionate Egyptians protesting for a better future. 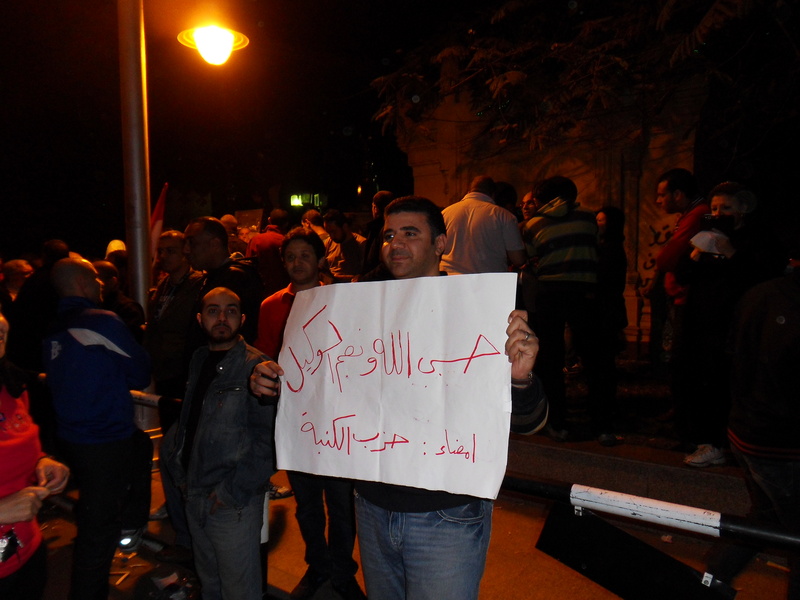 Upon my arrival to the protests. The first thing I noticed was the large presence of women and children. 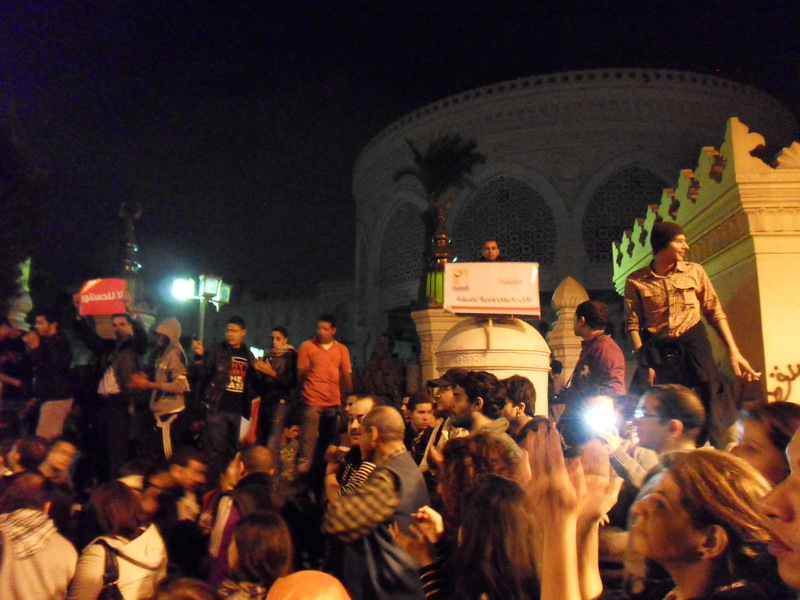 No one was sexually harassing the women and everyone was peacefully chanting alongside one another. 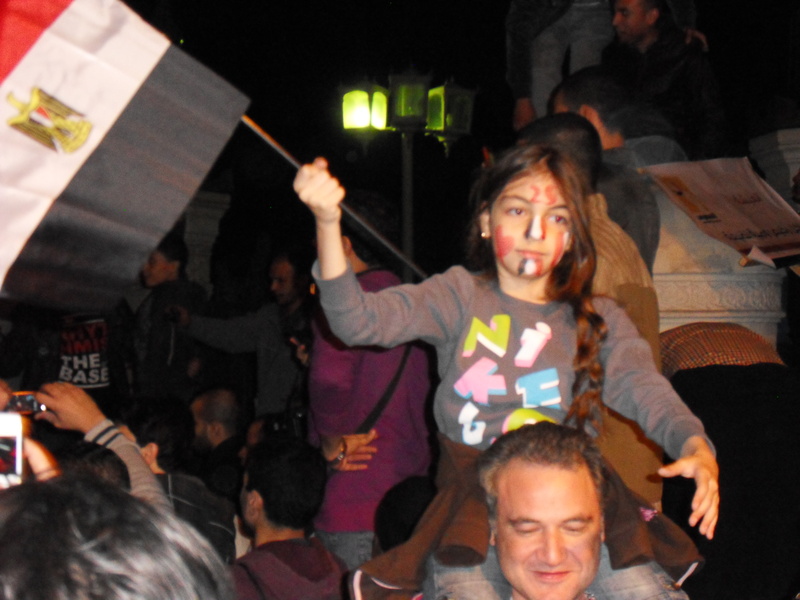 Flags were being given out, water bottles were available, and face painting – it was quite festive. 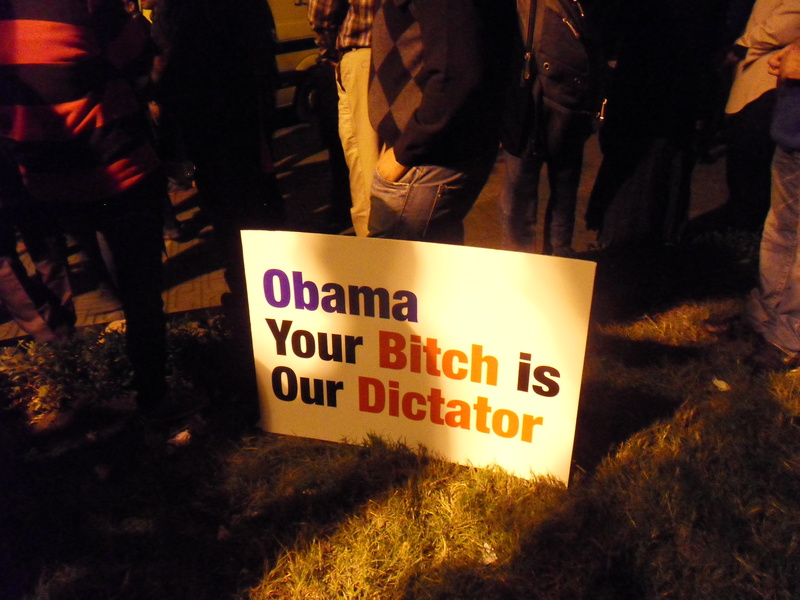 However, the best sign I found was the one below. As hundreds of thousands continue to protest against Morsi’s dictatorship, the USA has remained silent: not a single condemnation has been issued by the Obama administration. 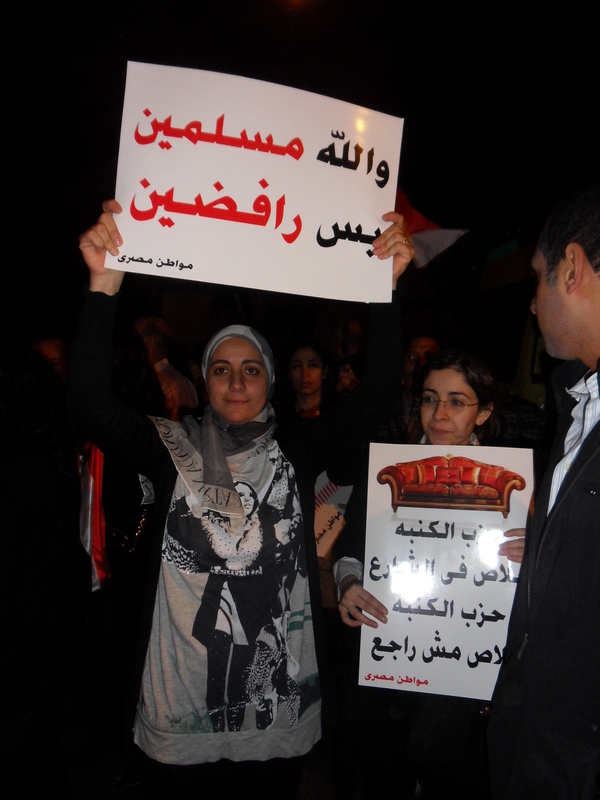 The US government should express outrage as opposed to silence at Morsi’s dictatorial actions. 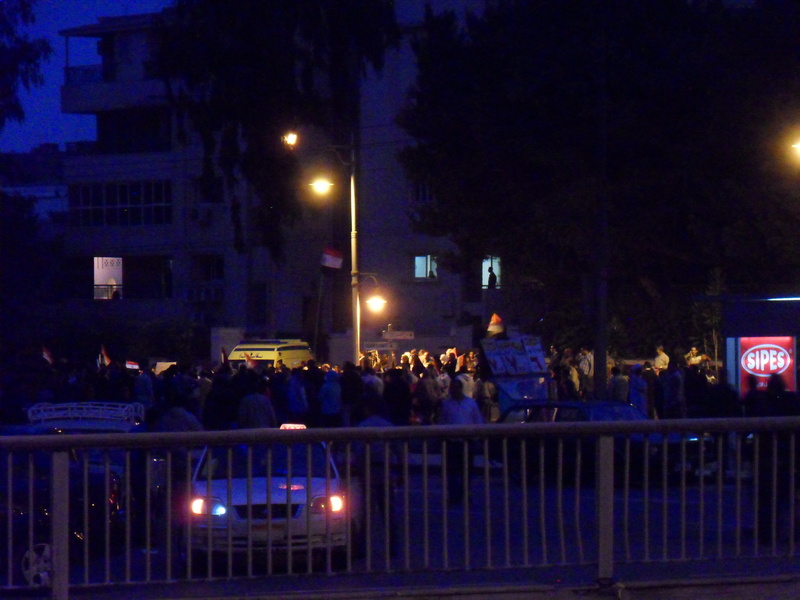 During the first few hours, the main road of ‘El Etihadiya’ was blocked off by security forces. However, due to the overwhelming number of protesters – as more marches started to reach the palace – security forces completely withdrew. A new group of protesters had arrived. The existing protesters broke out in cheers and clapped upon their arrival. Security Forces blocking the road. People were talking with the officers across the barbed wire. 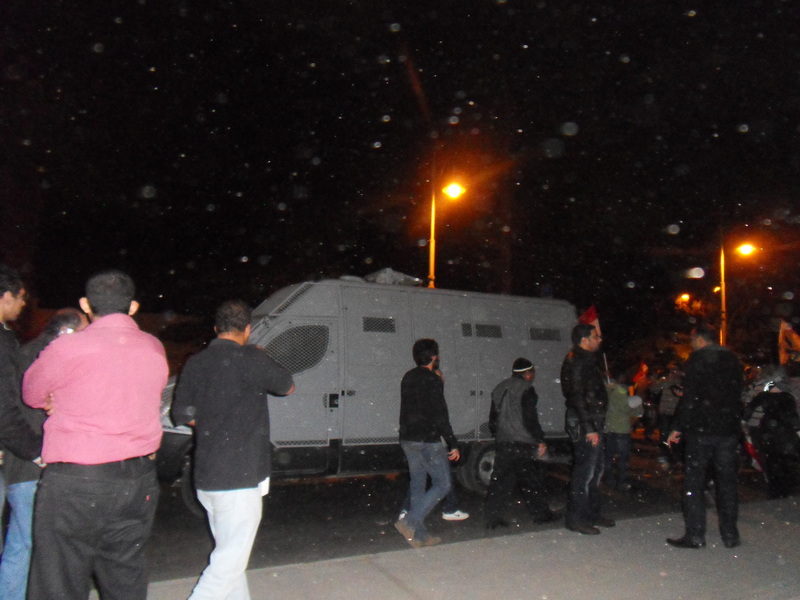 The security forces completely withdrew and this police vehicle seemed to join the protesters. The officers inside it started waving Egyptian flags. As the protests flooded into the road, their numbers greatly increased. 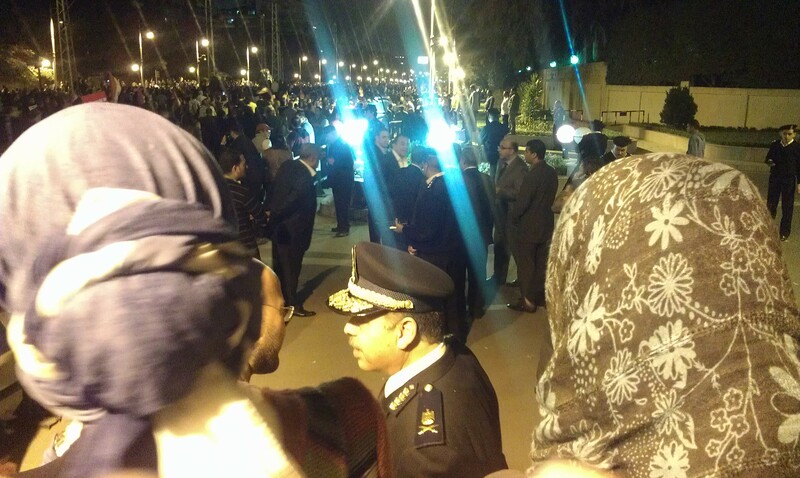 Several security officers remained at the scene and were chatting with protesters. Police Officer talking to protesters. Side entrance to the Presidential Palace. 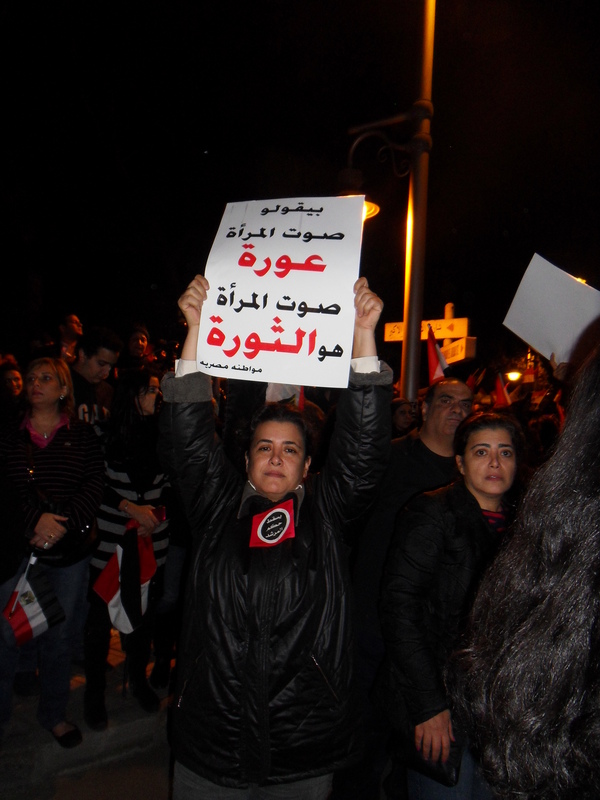 The protesters avoided confrontation and instead remained on the main road in order to maintain a peaceful protest. The police officers were very compassionate. One traffic officer stated “We cannot and we should not hurt the protesters. Anyone of them could be my sister, my cousin, my grandfather, or my uncle. 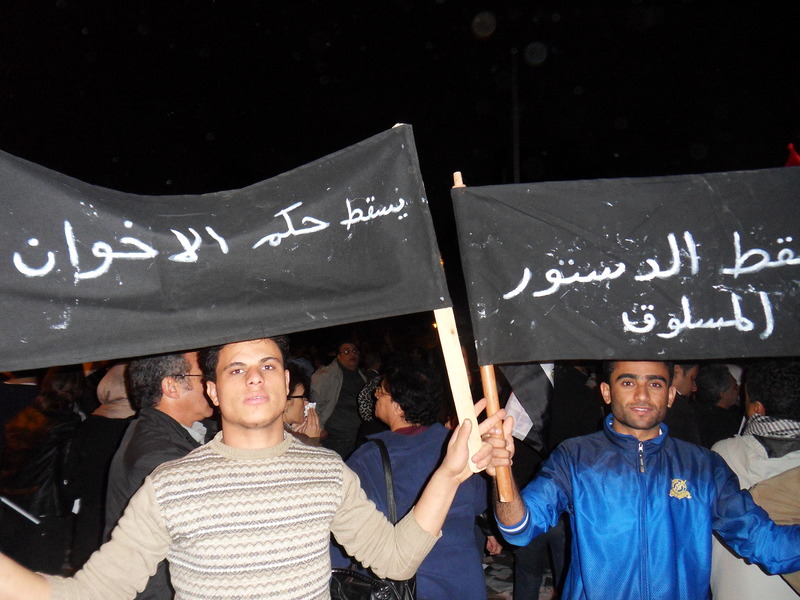 They are fellow Egyptians. They are family.” Another officer with the Ministry of Interior stated that the difference between the protesters present today and those of the Muslim Brotherhood is monumental. He even jokingly stated that “You guys even smell better than the Ikhwan” – to which a protester replied “Your tear gas smells good too!” Promptly afterwards tear gas did start pouring down. This was my first experience with tear gas – it burns your eye lids first, and then slowly starts to burn your eyes which blurs your vision. It was surprising that they would fire tear gas on their own officers as well. 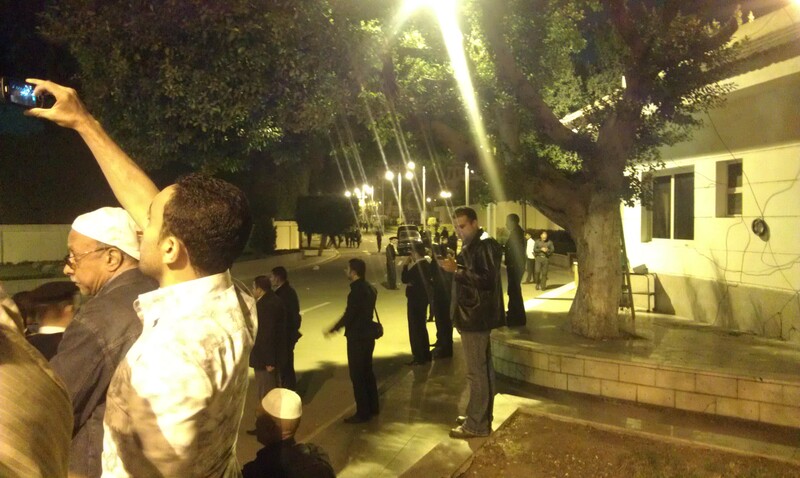 However, after reading news reports, the tear gas seems to have coincided with Morsi’s escape from the Presidential Palace. Photograph I took right before the tear gas. Returning to the Presidential Palace after a much needed break (and plenty of water to ease the tear gas’ effect), the crowd was still as vibrant and strong. The Muslim Brotherhood’s spokesperson stated that there were only 2,000 protesters today: The Muslim Brotherhood and Morsi are living in a bubble. After the tear gas, there was not a single security officer left. 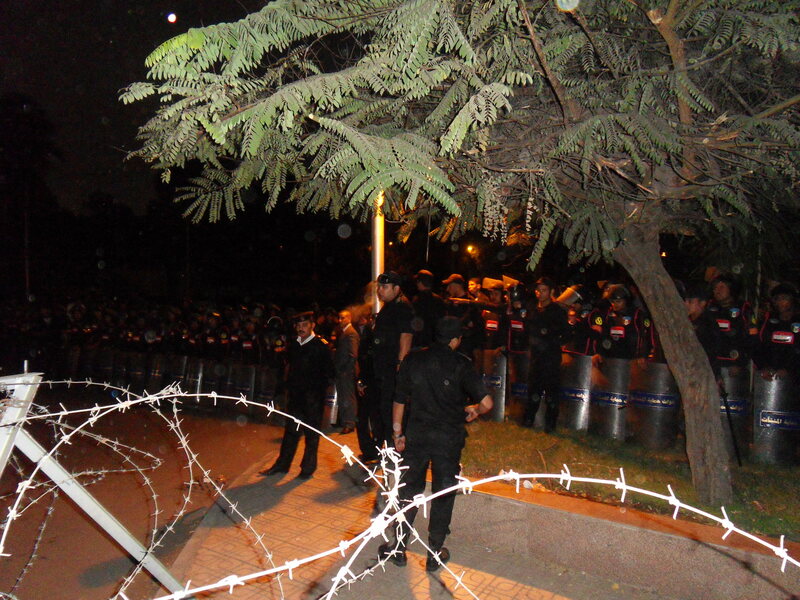 The walls of the Presidential Palace were quickly coated in graffiti and protesters stood outside the gates of the palace with absolutely no interference from security forces. This man stayed in this position for a long time. Even though it started to get late, people were still dedicated to their cause. One of my favorite photos from the night. 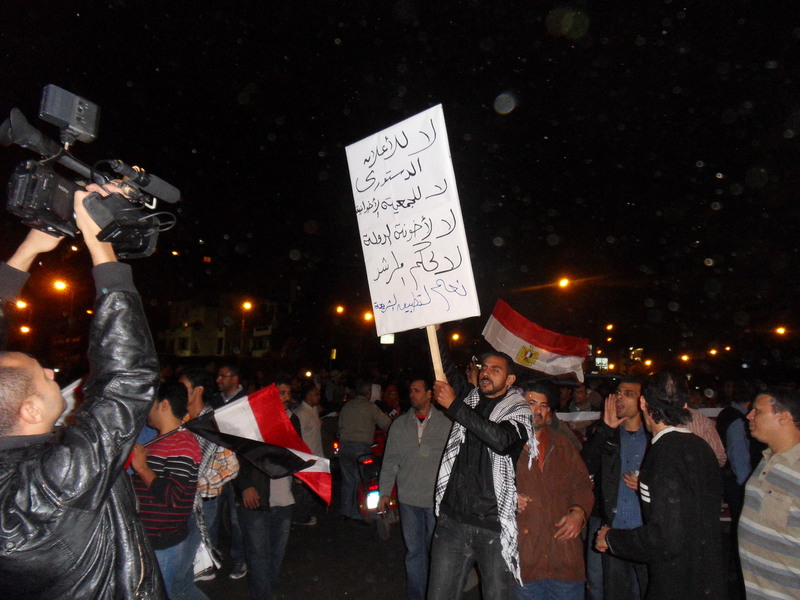 It is amazing to see how passionate Egyptians can be about their country. At one of the entrances to the Palaces. What did tonight prove? That Egyptians will not remain silent as their country and society is ripped apart brick by brick by the Muslim Brotherhood. 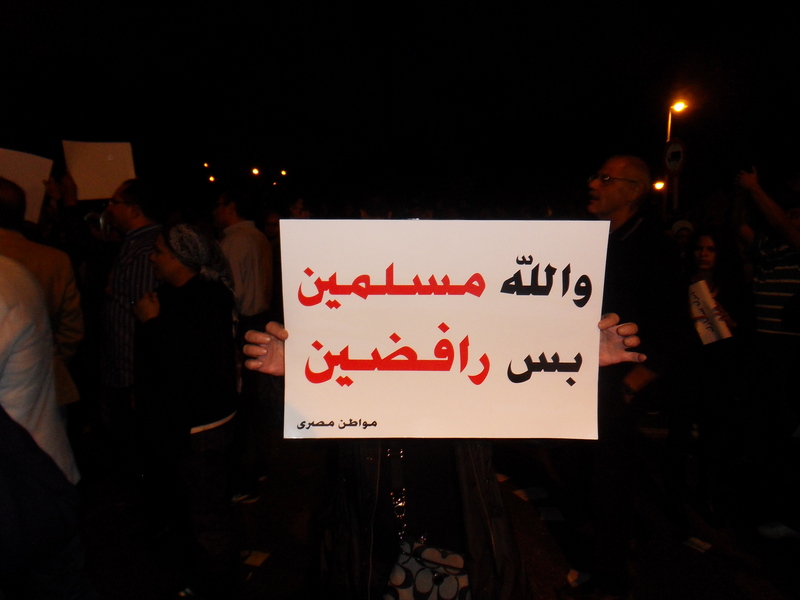 Tonight, Egyptians that have never protested went onto the streets, risked their lives, and asked Morsi to step down with his dignity. There were no reports of violence. No police officers were hurt. The palace was not attacked. 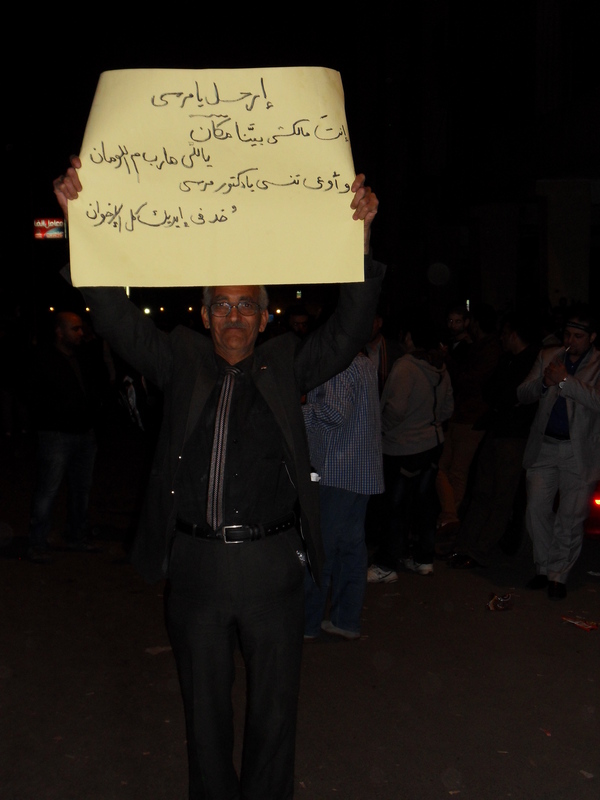 Tonight, Egyptians proved to the Muslim Brotherhood that they are not ‘thugs’. Tonight, I stood by some of the most honorable and respectable people I have ever come across. 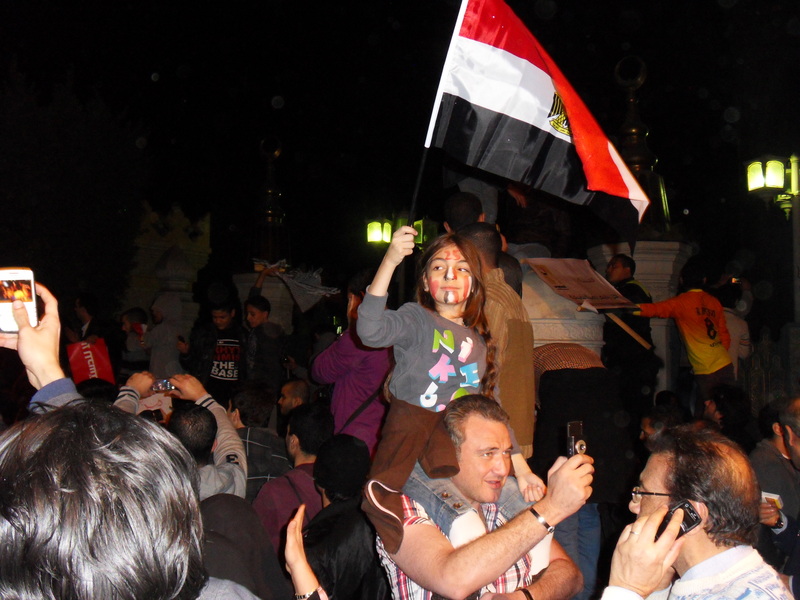 Tonight, Egyptians showed that they are united for one goal: a better future.